Moraine Lake Road, in the Lake Louise area (Banff, AB), is pretty much the first trackset skiing destination in the Banff-Lake Louise area. For the same reason that the first World Cup downhill races (mens and ladies) are held at Lake Louise, Moraine Lake road (MLR) is in a cold, fairly high altitude place. Ideal for nice cold tracks that are usually easy to wax for. There are three classic tracks, and a wide skate skiing track in the middle. Seems to be groomed daily. About 9 kms up, the tracksetting ends, and you get a nice view. 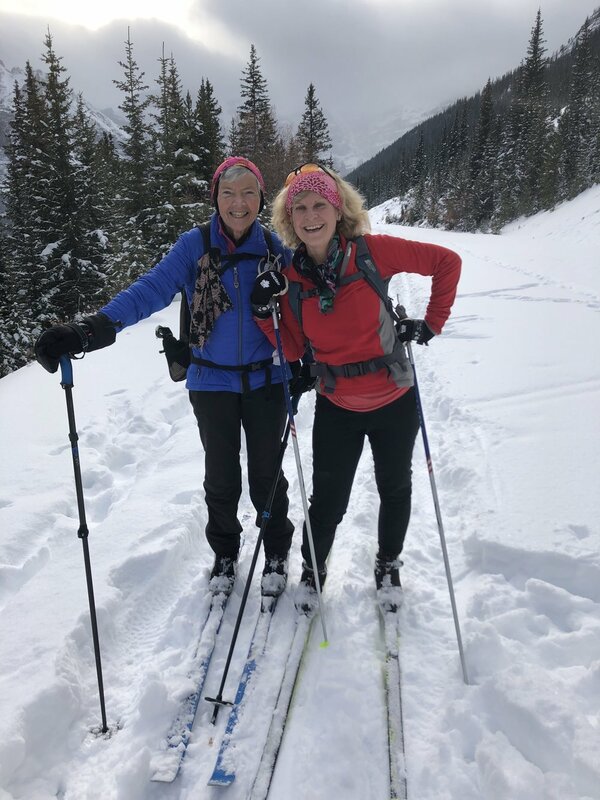 Sometimes, it’s safe to continue on skier-set tracks for another 3 kms to Moraine Lake, in the Valley of Ten Peaks (there is a significant avalanche path along the way). Today was safe, as there is still little in the way of a snowpack. It was a black, white, and grey day there, but pretty cool. In the summer it would be jammed with cars and people. Today - just fresh air and a great vista.